Living and working abroad for an extended period of time can be an exciting and challenging prospect. However, some people see working abroad as a pipe dream with too many obstacles in the way. But using exchange rates to your advantage could mean this dream can easily become a reality. Travel broadens the mind and allows you to view different countries and cultures other than your own. Many people come to a point in their lives when they want a break from humdrum daily activities and working abroad can be the perfect solution. Other people will go abroad to study or simply take advantage of the lower cost of living that enables an extended holiday. Whatever the reason, a year or two abroad can bring many benefits to a person’s life immediately, and in the long term. There are many countries around the world where the cost of living is far less expensive than the UK. Food, accommodation and simple day to day living expenses abroad can be a fraction of the cost compared with Britain. Exchange rates can govern how long your money will actually last in a certain country. If you have a job that involves telecommuting that can be undertaken anywhere via the Internet then you could be onto a winner. If you have an amount of money saved up, and it doesn’t need to be a lot, then living abroad can easily be achieved. There are certain countries in Eastern Europe or India where living expenses are a fraction of the cost you would pay in Britain. The exchange rates mean that you will get an awful lot for your British money in certain countries. Even if you are not intending to work abroad you can still take a very long extended holiday and live quite comfortably. Telecommuting jobs are a dream for those who do not like to be tied down. If you have a telecommuting job where you do not require much more than you laptop then there is nothing to stop you living and working abroad. There are certain legal implications that will need to be researched including tax, residency and visa rules. These will depend on the country in which you wish to live and how long you wish to live there for. If you are working abroad, say with a telecommuting job, and still having your salary paid into your British bank account then there are considerations. You may be charged fees such as currency exchange fees every time you withdraw money at an ATM abroad. Using a direct debit card will be an option but you should check around on which banks give the best rates. Using credit cards abroad will bring higher fees and charges so try to avoid using these when possible. The world is your oyster but this saying is not necessarily true when it comes to exchange rates. 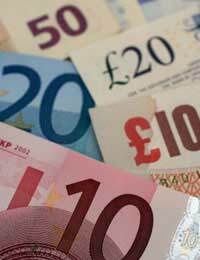 The British pound has taken quite a bashing recently especially when it comes to the euro and the dollar. Make sure to research where you will get the most for your money. There are countries in Eastern Europe where it is possible to have a very good standard of living for very little money indeed. British ex pats are people who are living temporarily or permanently in countries other than Britain. There is a huge ex pat presence on the Internet as this is one of the main communication methods when staying in touch with people back home. There are plenty of ex pat forums on the Internet where valuable information can be picked up on the standard and cost of living in various countries around the world. This is a useful source of free information if considering living or working abroad. At some point or other you may want or have to return to Britain so make sure that you have kept everything legal such as visas and work permits. Never outstay any visa time limit or you could face nasty consequences when you try to leave a country abroad. Don’t live beyond your means either. You may have a very comfortable standard of living due to the exchange rates but always keep emergency money. This should at least cover the return flight home and a little extra. The dream of lying on some far flung beach while working from a laptop is not the pipe dream many people think it is. Excellent exchange rates, cheap flights and accommodation, and the rise in telecommuting jobs can mean this dream is closer than you think. Research your options and build up some personal savings before taking off for an extended holiday in the sun.